Starting this March, The Shed is now available for lunch! Visit the “Hours” section below for new restaurant hours! The Shed: "A Unique Tavern Experience!" Mon: 11 a.m. to 9 p.m. Wed - Thurs: 11 a.m. to 9 p.m.
Fri - Sat: 11 a.m. to 10 p.m.
Sun: 11 a.m. to 9 p.m.
Holy moly! The reviews are right! Join us at the corner of Royal Street & Center Circle! The Shed is a casual spot to enjoy the game, have a beer, partake in an order of pulled pork nachos, and relax with friends. 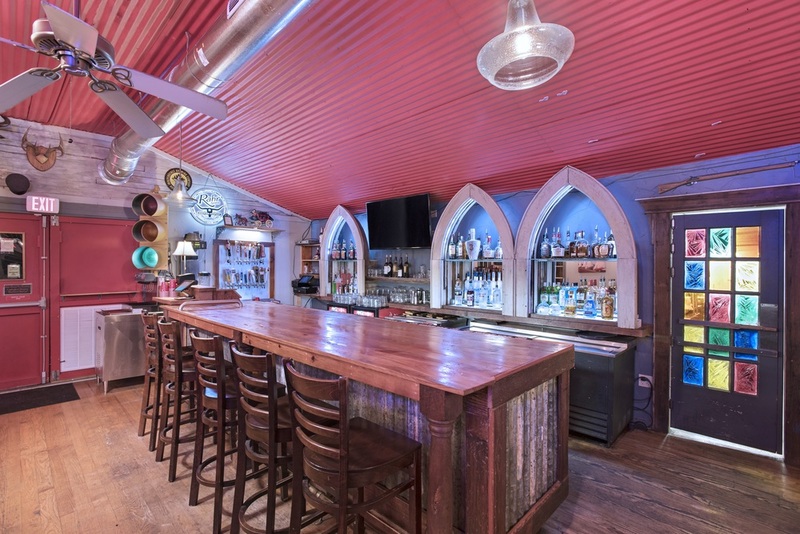 From the mason jar chandelier above your head when you first walk-in, to our unique bar, fashioned from the arched windows of a charming old church - you'll love our relaxed, fun atmosphere! STOP! CAUTION! GO! You thought there were no traffic lights in the tiny Village of Salado? Wrong! Salado has ONE traffic light, and it's here in The Shed! It's how we tell the folks enjoying themselves with us that it's "last call". Green = Gulp, gulp, gulp! Red = Time to get a room at the Inn! We welcome planning ahead for large parties, and are proud of our newly-renovated banquet room. It's great for parties up to about 50! We're kid & pet-friendly, and even have an inviting "corral" the kids seem drawn to when the weather outside is nice. Looking for a fine dining experience? Enjoy dinner at Inn on the Creek's other on-site restaurant Alexander's Distillery.